Looking for a fun online casino game that doesn’t require the skill or strategy of blackjack, poker or other card games? Want to enjoy a game of luck but not a big fan of roulette or the slots? Consider keno, an exciting number game that’s becoming very popular with players at online casinos. We explain how to play keno, the rules of the game and where you can find real money keno at the best casinos on the Internet. Keno is a lottery style number game. It’s incredibly easy to play and can be enjoyed by players of all skill levels, making it popular amongst recreational players who like to throw down a casual bet every now and then. Keno can be found at land based casinos, online casinos, bars, clubs and lottery outlets around the world. The aim of the game is to correctly predict the numbers that will be drawn at random from a pit of keno balls numbered from one to 80. Games usually require a maximum of 20 picks, but some games may be capped at 10 or 15. This luck-based format means you can play keno regardless of your previous betting experience, with beginners having just as good a chance of winning as experienced players. When playing keno online or offline, the first thing you need to do is decide how much money you want to play for. Keno games are very affordable, usually starting around the $1 mark, although you’ll find even more lenient betting options when playing at an online casino. Once you’ve selected the size of your wager, use your keno card to select up to 20 numbers that you hope will be the lucky ones drawn from the pit. You can pick less than 20 numbers, but you’ll need to make the maximum number of picks to be eligible to win the elusive jackpot. When all wagers are in place and your numbers have been picked, the 20 winning numbers are drawn from the pit of 80 balls, determining the winning numbers for that game. If you’ve managed to make any matches, you’ll be rewarded with a payout based on the size of your bet and the corresponding pay-table for the game at hand. Difference between live and online keno? 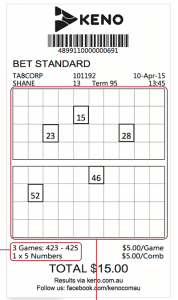 Whether you’re playing keno online or in real life, the basic format and rules of the game are the same. The major difference lies simply in how the game unfolds. In online keno, you use your mouse to click the numbered grid to select your picks, and then an RNG (random number generator) is used to randomly determine the winning numbers, displaying the results on your computer screen. If you make any matches, the numbers are automatically highlighted and any winnings are automatically credited to your account. When playing keno in real life, you manually make your keno picks with a pencil on a piece of cardboard and register your picks over the counter in exchange for a keno ticket. You then watch the results unfold on a television screen to see which winning numbers are drawn. After the draw has finished, you will need to check your keno ticket over the counter to see if you’ve won and receive your cash payout if applicable. Some land based venues also offer video keno, where you can place bets using a touch screen. As you can see, online keno provides a much more convenient option. Not only do you not have to bother leaving the house, you’ll never have to worry about losing a winning keno ticket again. Your odds of winning keno vary between each game and are dependent on the amount of numbers you have picked. The good thing is you don’t need to hit all 20 picks in order to walk away a winner, as even a couple of matches will earn you a modest payout. If you’re chasing the big bucks, it’s important to know that your chances of winning the jackpot in keno are painfully low, with odds of hitting all 20 numbers sitting somewhere around the 3,535,316,142,212,173,800 mark. When playing online keno, a pay-table is listed to the side of the screen at all times, updating in real time if you change the size of your bet, so you’ll always know how much money you stand to win. Your chances of winning keno rely 100% on good old fashioned luck. In keno, every ball has a legitimate one in 80 chance of being drawn, and there’s nothing a player can do to influence the results of a draw. Your only real concerns are choosing where to play keno, how much money to bet and which numbers to pick, although it will make no difference which numbers you actually choose to play. Your best bet is just to accept keno for the fun game of chance it was intended to be and enjoy the ride. If you want to play a game that requires more skill and strategy but still caters to newbies, consider giving video poker a try. Keno can be found at a majority of our recommended online casinos. These casinos have undergone the stringent BettingPlanet testing process to ensure games are safe and fair and that the vendor is legally licensed and adhering to industry rules and regulations. Play keno at any of our top-rated casinos and you’ll also be eligible for some awesome new player welcome bonuses available exclusively to our readers. 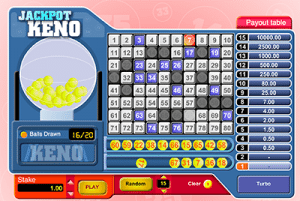 Online keno games are available for instant-play, with no downloads required, and can be sampled for free in demo mode directly over your Web browser. If you like what you see and decide to move on to play for real money bets, you can make an instant cash deposit in your local currency using a trusted payment method like Visa, MasterCard, Neteller, Skrill, Paysafecard, ecoPayz, Entropay, PayPal, Bank Wire and more. Want to give online keno a try? Head to any of the recommended casinos here at BettingPlanet.com to play at a safe, reliable venue where you can play for the chance to win real money from the comfort of home. Online multi-wheel roulette – what is it? The Get On Club is your direct line to latest greyhound and horse racing news, betting tips, odds& bookmajer promotions. join now and Get on ! 2014-2018 Bettingplanet.com.au published by 8th Rule Media. All right reserved. 18+ Gamble Responsibly.